So anyway, I don’t want one of those, because my dreams are surreal enough without adding something to the mix that’s clearly food for night mares. But I do want in on the fun. My kids do, too; they’re still young enough to really enjoy a little Santa magic, and a doll who’s buddies with Santa sounded like a great idea to them. 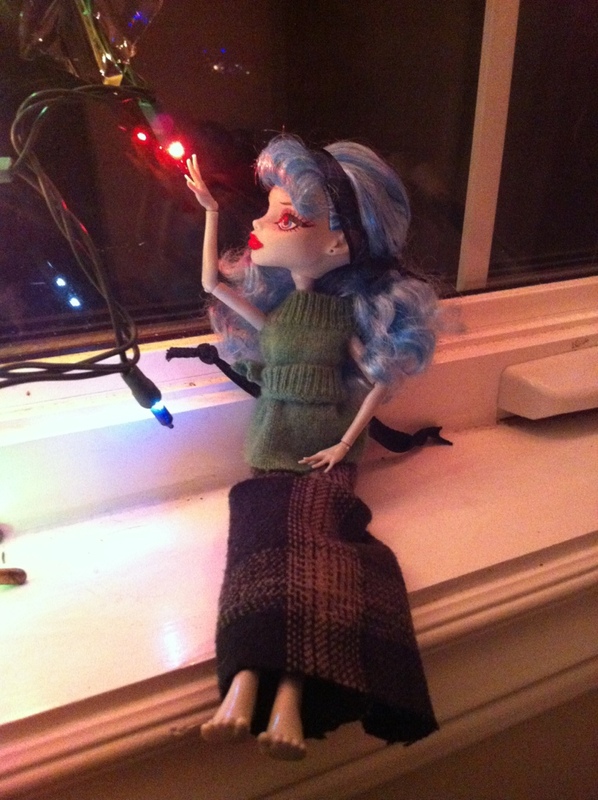 Hello, spare Monster High Ghoulia! She lost the glasses and traded her tarty dress for something a bit cozier, and the boys named her Amy Snow. I know, the outfit looks like Cinderella’s hand-me-downs, but it took me three hours to make. ** I just assume that the elf does this. This entry was posted on Friday, December 14th, 2012 at 9:23 pm	and tagged with christmas, Elf on the shelf and posted in Amy Snow, christmas, Holidays, Photos. You can follow any responses to this entry through the RSS 2.0 feed. Amy Snow will be returning soon! For anyone who missed it the first time around, here’s why we don’t have an Elf on the Shelf, and an introduction to the lovely Miss Snow, who does the job for us. Ha ha ha … oh my. Sounds like fun around the Sparkes household. I’m with you. That little elf is creepy. I think it’s going to haunt quite a few young minds in the future … scary. Looking forward to more adventures of Amy Snow. I think I already like Amy Snow she looks as if she might really enjoy life. I hope that she is as nice on the inside as the outside. You can never tell these days. I too look forward to her adventures. She was nice last year. I hope she stays that way. Some of those elves make horrible messes in people’s houses! Sorry…but even in new clothes she looks a little creepy. Amy was a zombie? Ha ha!!!!! That’s so hilarious! Is that why her arms are so skinny? The new outfit gives her a respectability.